Denette and I were at Avila with the kids a few Sundays ago, whiling away the day in the sun and the water. As we left, we noticed the Avila Farmers Market was getting rolling, so we decided to visit. We were kind of disappointed. The market is more fun than functional, with only about six stands of produce vendors And only one fish vendor. Yikes. Chaparral Gardens, which makes the best vinegars I have ever tasted. Bar none. The owner was selling some organic mixed greens, and I wanted a salad when we got home so I bought some. Then I sampled his vinegars. 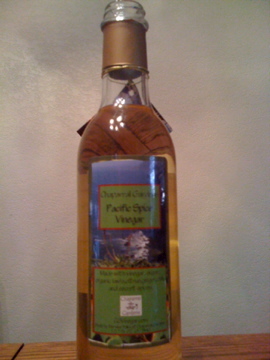 We came home with the Pacific Spice Vinegar, which starts off sweet and finishes with a beautiful hot spiciness. We went right home and had it on our salad. Then I proceeded to put it on everything else until it ran out. In a week. Yep, it’s that good. I was googleing my vinegars and your site came up. What an impressive garden you have! Thanks for the kind words on the vinegars we make. I cant eat a salad without it as well. Good luck with your harvest! yum. 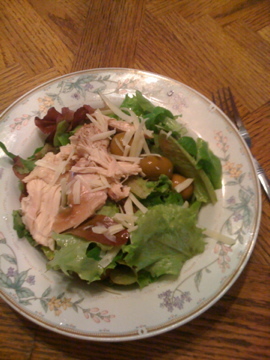 i loves me a good salad. sometimes crave it. I’m going to have to ship you a bottle of this stuff. It should be illegal. It probably will be. I’m stocking up now!